Monday 26th August - Restaurants are opening left, right and centre at the moment (Chop Shop, Le Coq, Smokehouse, Gin Joint and many more), and Team List managed to grab a table for the first soft opening night at Coal Vaults on Wardour Street. 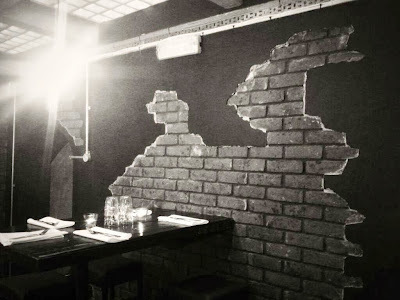 This restaurant & bar is situated in an underground space that was used for storing coal in the early 19th Century, and focuses on tapas style British food, with matching cocktails. As it was a soft opening, we had 50% off the food bill, and a free glass of champagne to start us off. There were a few teething problems - no aircon, lingering paint smell, broken dishwasher - that will no doubt be fixed shortly. We were very well looked after anyway, and it's all part of the fun of opening night! The cocktails are designed to match the food, though no pairings are suggested on the menu. Wine and beer are also in good supply, with bottled beers from the Crate and Camden breweries on offer. We decided to stick with the champagne and get stuck in to the food. Our first two courses to arrive were 'Pulled' Rabbit with smoked black beans, sweetcorn and pineapple relish, avocado, sour cream & flatbread and '5 hour' shoulder of lamb cooked in hay & lavender with caper, mint and spiced anchovy couscous. They set the bar extremely high, especially the rabbit which was beautifully cooked, though I would never have guessed at there being any anchovies present in the delicious couscous. Next up we had Charred courgette, caramelized red pepper, goats curd and hazelnut salad and I Camisa antipasti platter with black olive and fennel bread & home pickles. Two more good choices, though they should perhaps have brought these first? The food menu reminds me of The Shed in Notting Hill (read more here) where the chefs decide on the best order for dishes to be brought out once you have made your decisions. Everything on the antipasti platter deserved its place - the pickled broad beans were lovely, and we fought over the last piece of bread. The goats curd was wonderfully light and complimented the other flavours in the salad. 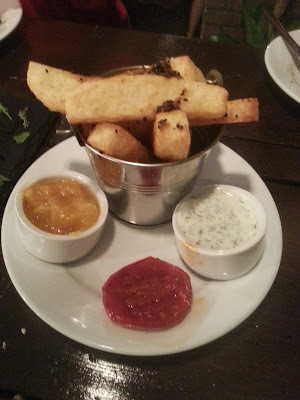 We finished off with a generous portion of Bombay chips with roast tomato, mango & lime chutney, and coriander yoghurt - interesting to serve the chips with dips traditionally associated with popadoms. The chips were fantastic even on their own, and the roast tomato was a welcome addition. We decided to skip desserts, though I might need to go back to try their Earl Grey Bread with vanilla butter and homemade strawberry jam as a loaf of the bread was taunting me from a distance. We turned our thoughts to cocktails, and discussed some ideas with one of our entertaining waitresses. She brought us over some tasters of Roasted Fennel Seed Vodka and Toasted Macadamia Liqueur to give us some ideas. After a while we all decided that we were not drinking anything with macadamias in - it turned out to be some concoction of bitters left on the side by the barman! We eventually decided upon New Rose (Gin, Cucumber, Dry Vermouth, Pink Pepper, served with Pickled Celery & Cucumber), Marano (Mirto Rosso, Gin and Crushed Blueberries, with a matching glass of Prosecco) and a Rodeo Drive (Bourbon, Roasted Macadamia Liqueur, Lemon & Egg White, with a fresh Cherry). We were sadly quite underwhelmed by our choices, and felt they all lacked a bit of a kick. Perhaps they come across better when drank alongside particular dishes, but this is not really an achievable plan if you are sharing several plates. That said, I don't think it would take much to improve them, and the food was outstanding across the board. 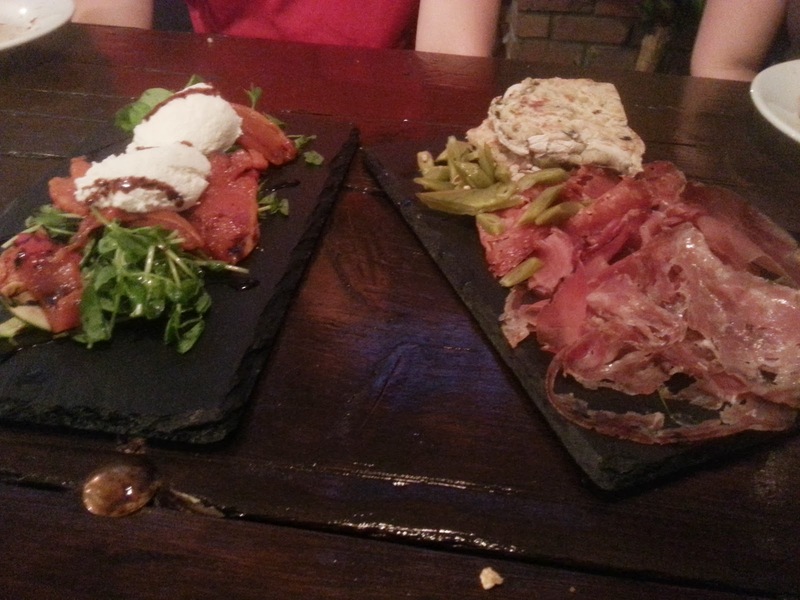 Even without 50% off, Coal Vaults offers good value for high quality dining which will only get better as they settle in. The decor is a little rough around the edges, and varies depending on where you sit. Your best bet is hiring out one of the secluded vault spaces with a group of friends. The atmosphere was enjoyable with just the right level of noise to enjoy chatting over dinner and drinks. Verdict: Sublime food outweighs our issues with cocktails (Crate IPA would do for me anyway) - give them some time to get air conditioning and then head on down! Luke & List Leader Natalie were keen to get another List point so we headed back out into Soho to see what we could find. Before too long we found ourselves in Scoop on Brewer Street, ordering a load of ice cream. It's a lovely little gelateria that also has waffles, crepes, cakes, milkshakes and "scoffee" - a blend of espresso coffee and ice cream of your choice. They don't have any particularly crazy flavours that you might find at Gelupo or Chin Chin Ice Labs, but making your choice is extremely difficult. Luckily they are happy to let you taste several varieties before you make your decision. If you are feeling particularly indecisive, just order one of their mammoth cones that holds up to 6 flavours. Hopefully they will have some Torroncino left next time, made from hazelnuts from Piedmont and almonds from Montelimar. 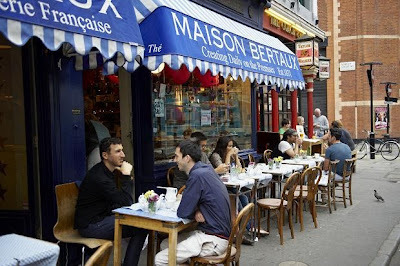 They also have shops in Covent Garden and South Kensington, and stay open as late is 23.30 most days. Sunday 25th - A few quick mentions from the day before as I ended up in Soho with the same team on Sunday as well. We started the day off at the Real Street Food festival on Southbank (which I have blogged about before - read more here), drinking some excellent craft beers from Craft Beer Rising, the Meantime Fresh Beer Truck and Look Mum No Hands beer popup - truly impressive to have three interesting options for quality beer in such a small space. 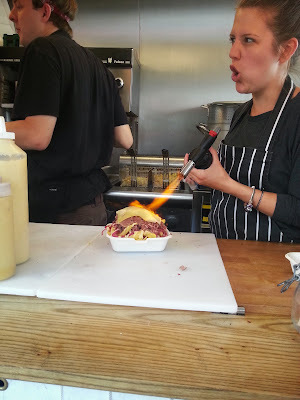 We munched our way through several dishes, starting with yummy Dirty Fries (chips with cheese, lettuce, salt beef and probably more) from The Bell & Brisket van. We also tried out Dosa Deli (delicious vegetable dosas), Community Kitchen (meaty wraps), and Kirsty's Kitchen (homemade scotch eggs) whilst soaking up the sun with our beers, before wandering over the river. 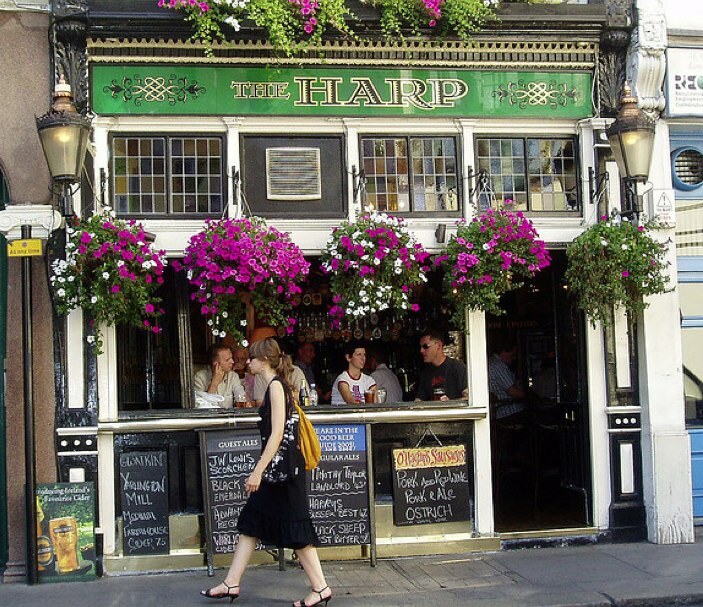 There was no real plan for the day, so we decided to stop off in the Harp Pub, one of central London's greatest boozers. 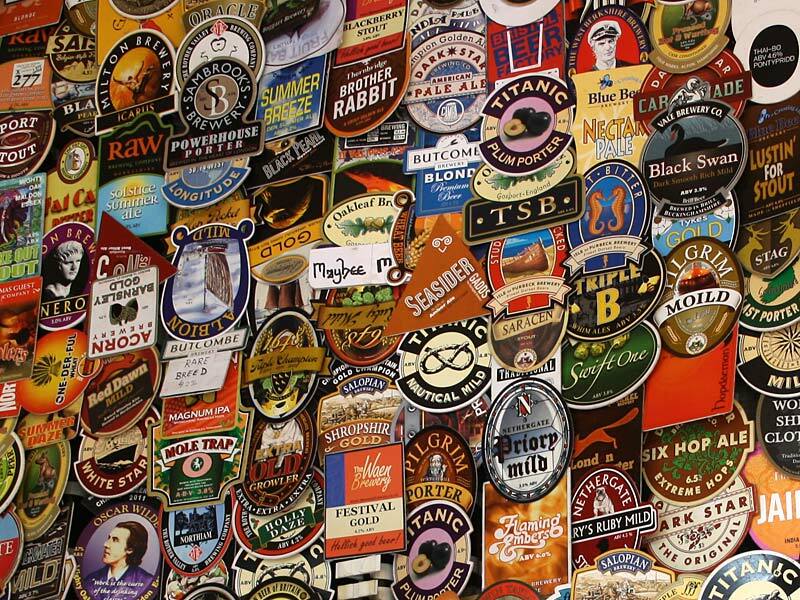 It's a tiny little place which can get stupidly busy, but it is worth fighting through the crowds to get to the wonderful array of beers on offer. It constantly wins awards, and was impressively crowned CAMRA National Pub of the Year in 2010/11. They serve "award-winning" sausages which apparently run out very quickly. 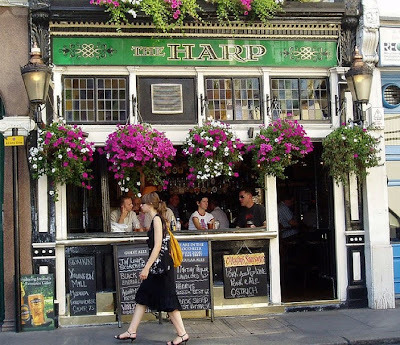 Try and get a seat at the open windows where you can do some Covent Garden people watching, and chat with drinkers the other side of the wall. 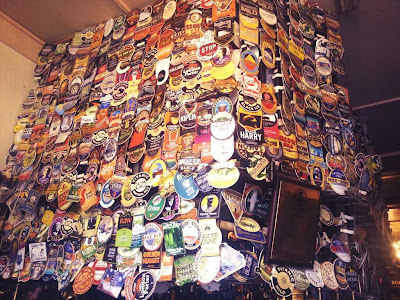 We weren't sure whether to eat or drink anymore and so we rambled around the Seven Dials before heading in to Soho in search of inspiration. We eventually settled at Maison Bertaux, a cosy patisserie and Soho institution - the perfect place to watch the world go by with a pot of tea and a cake. We were served by a charming lady (Madame Bertaux?) who pottered around the café making chit chat, and made us feel at home. Upstairs is not quite as glamorous as the ground floor and pavement seating, but there is interesting art on show all over the place, including stuff by Noel Fielding (The Mighty Boosh), Harry Hill and Sigur Ros, organised by Maison Bertaux co-owner and "Hooligan Art Dealer" Tania Wade. Points aplenty for Luke and Natalie with more coming this week. 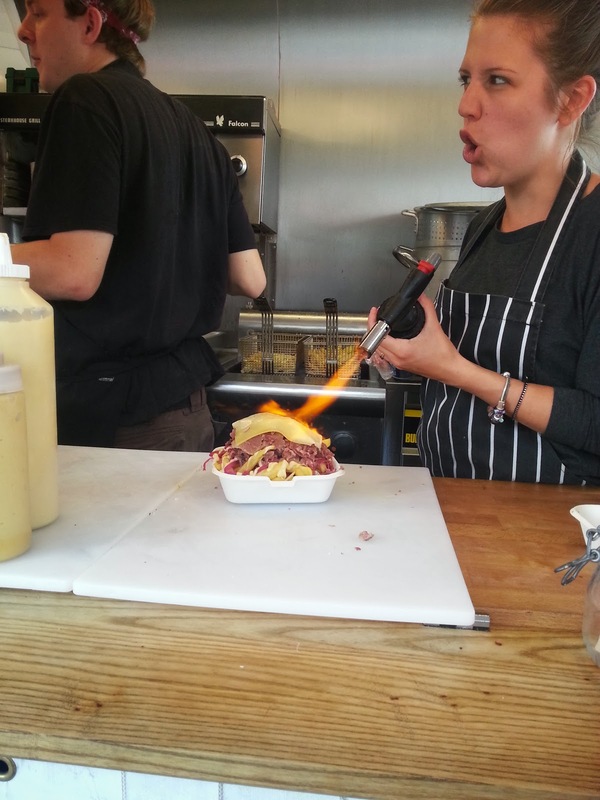 I'm off to celebrate National Burger Day at the Street Feast site in Dalston. Many restaurants over London are offering 20% off burgers today - head here to get a voucher. Mummy List has expressed concerns that I eat too many burgers (obviously looking at the pictures rather than reading) - this evening is not going to help my case.